Did Yes Bank reported wrong non-performing loan (NPA) figures for financial year (FY) 2016 to help sail its QIP offer? Why did the qualified institutional placement(QIP) issue by Yes Bank got through the second time? And was a QIP issue really necessary? Foreign investors have always cried foul over how the Indian businesses are run by their owners. No transparency, running it like a family owned business and lack of accountability is what concerns many. Many big Indian companies have tried to mend their ways, but surely not Yes Bank. Yes Bank is the fifth largest private sector bank of India, founded by the present CEO Rana Kapoor in 2004. The bank boasts of new age banking, constant innovation and use of technology to improve the customer experience. In a recent audit by the RBI, Yes Bank?s total gross non performing assets was calculated at 5% for FY 2015-16, rather than 0.76% reported by the bank itself. ?This has increased the gross NPA of Yes Bank to Rs 4930 crore at the end of FY 2016 as against Rs 750 crore declared by the bank at that time. ?According to analysts, the RBI?s audit of bank numbers typically happens in Q3 or Q4 of the subsequent financial year, and therefore, FY 2015-16 numbers came up for scrutiny only in the second half of financial year 2016-17 (FY17). But, why did they do it? An under reporting of over Rs 4,000 crore of bad assets? Yes Bank for all the unknown reasons was keen on to float a QIP offer and get on board some big names, because I don’t buy their capital adequacy ratio theory. ?Putting it very simply, a?QIP is an easier way to generate funds by a listed company. Qualified institutional borrowers (QIBs) are only allowed to participate here and they get the shares at a discounted price. A question kicks in. Does Yes Bank really needed capital at that time to trigger a QIP? According to the bank, a QIP will help it to improve its capital adequacy ratio(CAR) and fuel the growth for the next few years. But, as of March 2016, Yes Bank had a healthy CAR of 16.50%, up from 15.60% a year earlier. The new Basel-III norms effective from March 2019, will require banks to have a minimum CAR of 9%, in addition to a capital conservative buffer of 2.5% of the risk weighted assets. This means the new rules would have required banks to maintain a minimum capital adequacy ratio of 11.5%, a figure Yes Bank was pretty securely sitting on! For comparison, the capital adequacy ratio of Axis bank at the end of FY 16 was 15.29% and of HDFC Bank was 15.53%. Yes Bank started with by tempering the bank’s gross non performing assets figures of FY 2015-16. When every other lender was bogged down by defaults (by comparison ICICI reported figures were 5.85% of its loan book & Axis bank had at 4.5%), Yes Bank beat the market expectations by posting a gross NPA figures of 0.76% !! This created an uproar in the market, with funds giving long calls on Yes Bank share and projected out-performance in the near future. Share price of Yes Bank rocketed and suddenly Yes Bank floated the idea of issuing a QIP(qualified institutional placement) into the market. Considering the FY 2015-16 results and the India growth story, many marquees investors, long only funds, hedge funds, pension funds and others joined the fray to get hands on the ‘smartest’ bank in India ! ?There were names like T Rowe Price, Black-Rock, Goldman Sach’s own asset management arm and even hedge funds like Segantii Capital and Halbis, in talks to subscribe to the issue. Yes Bank came up with the size of $1 billion for the QIP, at a price no less than Rs 1410, as the CEO told to a TV reporter. Though the investors were eager to get a pie of Yes Bank, but not at this price. The Indian banking industry wasn’t in a good shape and they went back and forth, but didn’t commit to the issue. This prompted Yes Bank to extend the window, thereby sending wrong signals to the Stock market. The highly sensitive stock market caught a whiff of it, and the stock tumbled all the way to Rs 1321.25 from the opening price of Rs 1387. Yes Bank was offering the QIP at Rs 1350, so the whole process didn’t make sense, and eventually the QIP was called off. What was Yes Bank trying to do here? Essentially QIPs have a positive effect on your stock price. The way the FY 16 numbers came, then the QIP issue soon followed towards the end of June 2016, this had a great effect on the share prices of Yes Bank and it took a hockey stick trajectory. But as mentioned Yes Bank couldn’t handle the QIP issue due to the size and pricing and calling off the QIP in September 2016, took a toll on its share price, evident by the graph above. But, all the way, Yes Bank?cited ?misinterpretation? of new rules for the so-called qualified institutional placement as the reason for the QIP failure and that a follow on QIP is on the cards and kept the regulators, Dalal street and common investors in dark about the quality of its assets. The failure of QIP offer lead to a huge downfall in the share price of Yes Bank. 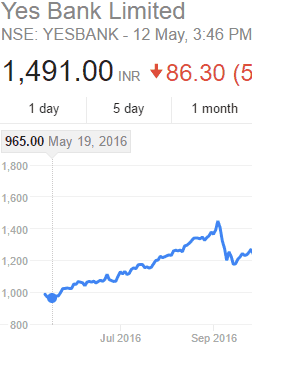 It touched a low of Rs 1174.65 on Sept 16,2016. The Q3 results of FY 17 was the key to the bull run and the numbers couldn’t be more absurd. The key to the profits, to project the growth story, a smart bank who is not affected by the bad loans, was this figure. ?At Q3, gross NPAs of Yes Bank stood at Rs 1005.85 crore or 0.85% , which led to lower provisioning and contingencies and hence higher profit. Remember Yes Bank started with Rs 750 crore as a declared bad debt in March 2016 and hence accumulated a further Rs 255.85 crore in the first 3 quarters. This bad debt figure could have been much higher as the now RBI report suggests that Yes Bank had Rs 4930 crore as bad debt in March 2016, not Rs 750 crore as declared by them. This would have made the gross NPA to be at Rs 5185.85 crore (or lower, assuming some bad assets could have got upgraded to a standard asset) , which would have eaten most of the profits and Yes Bank should have posted a big loss in that quarter. This never happened. The ship built on lies of NPA figures sailed. Stock soared, follow on QIP subscribed by some big investors and CEO Rana Kapoor became a paper billionaire. I still don’t understand what the bank gained out of this all, apart from the QIP. I think there are more skeletons to be unearthed here. Yes Bank is surely sitting on a lot of bad assets than what the market can imagine. I feel RBI should scrutinize all private banks. Otherwise, investors would loose interest in investing in banking stocks. Yes, RBI should look into this. It is giving a wrong message to investors. Yes, RBI should do some work here to restore the faith. Hiding Rs 4100 crore of bad loans isn’t something that can be looked away. Some idiot without bankinh understanding has written this article.. may be paid by a competitor to do… such eebsites are known for supari journalism. It’s better to refute the claims rather using graphic language. Hi, I have put facts to support my article. I don’t take money to cry fowl. I am an ex banker, so I do come with some knowledge here. RBI should look into this matter. These guys can’t play with common man money.